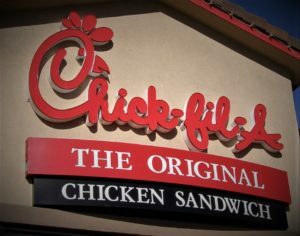 Home » RESTAURANT » BREAKFAST TIMES » What Time Does Chick-Fil-A Stop Serving Breakfast? When Does Chick Fil A Open ? When Does Chick Fil A Close ? Chick fil A are known for their selection of fried chicken dishes, but they also happen to offer some of the best breakfast food around! Not only can you find unique chicken breakfast foods, but also all of the standard breakfast fare. What time does Chick Fil A stop serving breakfast and what time do they start ? you can find the answer to this question below by browsing the table below for each day of the week and reading our Q & A section. Chick Fil A Breakfast times usually end at 10:30 am on the weekdays. Biscuit based breakfast sandwiches make up the bulk of the menu at Chick fil A. These are available with all the typical breakfast food fillings like egg, sausage, bacon, and cheese or you can just go for plain biscuit! Additionally, you can find breakfast platters as well as breakfast sandwiches that use English muffins rather than biscuit. Of course, being fried chicken specialists means that it wouldn’t really be a Chick fil A breakfast without some chicken! So, you can also get chicken biscuit breakfast sandwiches, bagels and as a breakfast platter. Should you be looking for something a little lighter, Chick fil A has you covered. For instance, you can get Greek yogurt parfait, a portion of hash browns, or Chick fil A Chick n Minis (mini yeast rolls with bite size nuggets). What Time Does Chick fil A Start Serving Breakfast? Chick fil A starts serving breakfast nice and early, so anyone looking for some breakfast food early in the morning can certainly find that here. For instance, the majority of Chick fil A start serving their breakfast food as early as 6 am! Other Chick fil A locations with start serving breakfast a little later at 6.30 am or 7 am. Some may start the breakfast service a little later however, usually around 8am at the latest. So, Chick fil A breakfast menu is available quite early in the morning, making it ideal for people that need to grab something to eat on their way to work, school etc. What Time Does Chick fil A Stop Serving Breakfast? Chick fil A stops serving their breakfast at a rather standard time. For the most part, Chick fil A will stop serving breakfast at 10.30 am daily. This should give enough time for most people to grab their favorite breakfast food – even if they enjoy sleeping in a little later! If you are looking for a precise time for when what time your local Chick fil A starts serving breakfast, you can do so by contacting them directly. The easiest way to get this info is to simply visit their website, search for your local restaurant. It’s a simple restaurant locator that should give you all the contact info you need for any Chick fil A. This can be quite useful as it also gives opening times, so you can be sure of finding a Chick fil A that is still serving breakfast! Chick Fil A is a restaurant chain that has become very popular over the years. It was founded in May 1946 in Atlanta which carries its culture to all over. When you think of Chick Fil A, you think of the best chicken sandwiches known to the northern hemisphere. You think of a warm environment where people love being able to create the best chicken sandwiches and serve them to you. It’s a pleasure to eat and to enjoy the wide variety of characters you meet there. What time does Chick Fil A Close ? and what time does it Open ? Below you will find in depth details for Chick Fil A hours. What Time Does Chick Fil A Open ? Chick Fil A has very standard hours all across America. This is good news as many of you will be from all over the place. The standard hours insure that everyone understands what they are about. You will be pleased to hear the news we have for you as you can get your poultry on quite early as most Chick Fil A open at 6 AM between Monday to Sunday. There are some locations that may open at 6:30-7:00 AM but for the most part, you can be an early bird in order to eat a bird. You can now start your day early with a Chick Fil A biscuit sandwich or perhaps their famous breakfast burritos. What Time Does Chick Fil A Close ? So you just got of your 9-5 or in some cases out of your double shift and you want to be able to get some quick and delicious food. We know how you feel as we often come out exhausted and just don’t feel like cooking much. Not to worry as Chick Fil A has very standard hours when it comes to their closing times. From Monday to Sunday, Chick Fil A closes at 10 PM. That will leave everyone with enough time to go get one of their awesome chicken sandwiches and feast on the deliciousness. Some locations will be closed on Sunday, so just make sure to check before you head out on the seventh day. Chick Fil A is known for their famous chicken sandwich but that is not everything they have. Asides from having a variety of sandwiches, they also have salads and wraps which will leave you utterly speechless as they will surprise you with quality. They also have food trays which is a great way to get the office place filled up as their will be more than enough food to feed a team of people. They have trays ranging from nuggets, chicken strips, chicken salad sandwiches, fruit trays, cookie trays and even chilled grilled chicken sub trays. Go down to your local Chick Fil A joint and see what they have to offer firsthand!